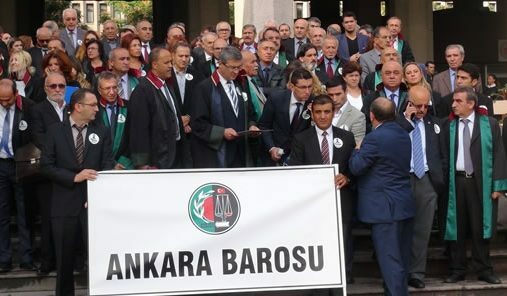 The Ankara Bar Association has strongly criticized two recent state of emergency decrees that were issued by the government on Oct. 29, saying they violate the right to a defense. “The goal of the recent decrees [675 and 676] is to destroy people’s right to a defense. The right that was challenged does not belong to the lawyers but to the people. It means closing prisons to the law,” said the association in a statement issued on Tuesday. Two decrees with the force of law issued by the Justice and Development Party (AK Party) government on Saturday contravene Turkey’s constitution and violate international law and agreements to which Turkey is a party, legal experts have said. Speaking with the Cumhuriyet daily on Sunday, Metin Feyzioğlu, the head of the Turkish Bar Association, said the government decrees are a move to deactivate Parliament. Stating that the decrees are an example of the AK Party government’s lawlessness, Feyzioğlu said the actions of the government through these decrees will oblige Turkey to pay heavy penalties in the near future. As part of the new decrees, the Turkish government will from now on protect the identity of prison guards in official documents, in a move that is apparently aimed at protecting them from legal action over torture claims. According to the new decrees, there is no need to read the entire indictment during court proceedings, a clear violation of the practices of the European Court of Human Rights (ECtHR). Another controversial measure, also violating ECtHR rules, taken by the government in the latest decrees empowers judges to rule on detentions without having the defendant appear in court. This article originally appeared in Turkish Minute on Nov. 1.